Through all phases of a man’s life, testosterone is the hormone which helps him to hold on to his male qualities and characteristics. 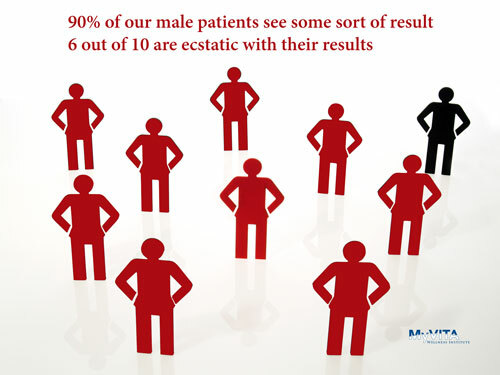 At some point, many men experience andropause. Andropause is the decrease in the testosterone levels or “Low T” within their bodies. It’s typical for many men around the age of 40 to go through this. They will start to show signs like beginning to experience weight gain, lower libido, and other natural signs of aging. Lowered levels of testosterone can also be associated with cardiovascular problems, obesity, and diabetes. Help your body achieve peak function with male hormone replacement therapy from MyVita. Request your free informational DVD or click here to book a free consultation with one of our specialists. MyVita Wellness offers male hormone replacement therapy in Houston, Texas. We have patients come to us from San Antonio, Beaumont, College Station, Austin, The Woodlands, Pearland, and other areas in south Texas. We look forward to helping you get to the root of you symptoms and back to enjoying the life you deserve. * Individual results may vary based on participation. The MyVita Wellness Institute website is intended for educational purposes only. A medical consultation is necessary before any diagnosis or individualized treatment may be provided. Contact us now for a complimentary consultation ($110 Value). Bellaire, Uptown, Pearland, Sugar Land, Montrose, and Houston and surrounding communities. *The U.S. Food & Drug Administration have not evaluated our product statements. Our compounded treatments and products are not intended to cure, prevent, treat or diagnose any disease. Individual results vary based on participation.